ADMISSION: General admission tickets will be available at the door for cash only at $8 and doors open at 7:30. 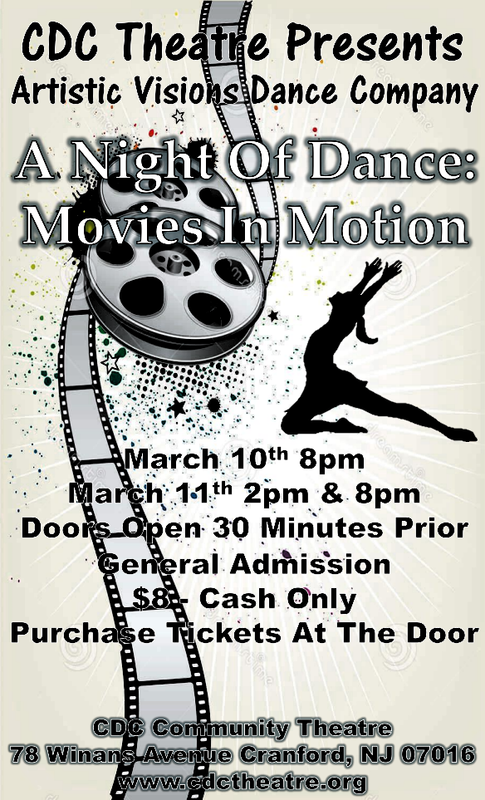 Come celebrate and enjoy a fun and entertaining night of modern dance. For a seventh year in a row Raven Dunbar’s Artistic Visions Dance Company will present a program of original modern dance pieces to the theatre’s community. The twelve dance pieces in this year’s themed show, A Night Of Dance: Movies In Motion, have been inspired by a range of iconic movies. Through the generosity of Artistic Vision Dance Co., all proceeds are donated to CDC Theatre. This group of gifted artists helps make it possible for CDC Theatre, in its 98th season, to continue offering live theatre and classes to the community.